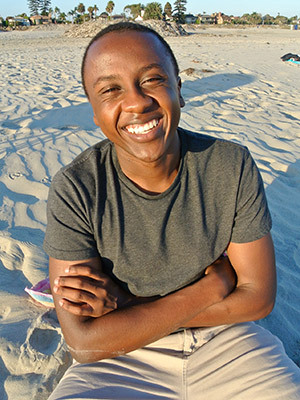 While pursuing a bachelor’s degree in nursing, Ian Mwangi accelerated his health-care career by getting his professional certificate as a clinical medical assistant through San Diego State University’s College of Extended Studies. He credits the program with his immediate hiring at Sharp Rees-Stealy. Mwangi answered some questions about his experience in SDSU’s Clinical Medical Assistant program. Please give us a brief history of your education and career. I am a certified nursing assistant and now a certified clinical medical assistant. I am also pursuing a bachelor’s degree in nursing to become an RN, and hopefully will pursue medical school in the long run to become a physician. What made you pursue SDSU’s Clinical Medical Assistant Professional Certificate program and how did you find out about it? I chose to become a medical assistant because I love to acquire knowledge toward my major and to interact with patients daily — learning not only about them, but becoming a person they can speak with is always pleasant. I found out about the program through my mother, who is a registered nurse. What do you think are the strengths of the program? The program developed not only my interpersonal skills but gave me the necessary clinical skills to do my job, and I have learned even more outside of the program. Also, we had an AMAZING instructor that took the time to help us. Cindy [Davis] was incredible and I would love to thank her personally for where my life is now. Where was your externship and how was that experience? I did my externship at Senta Clinic with Dr. O’Leary. The program gave me a foundation of how to be a medical assistant, and Dr. O’Leary was able to help identify where my strengths and weaknesses are and help me improve on those skills. I greatly appreciate what he did. I gained over 160 clinical hours. How long did it take to complete the program and how well did it fit into your life schedule? The program alone was about five months, excluding the externship which was another month (full time). The schedule was perfect because I worked in the morning and was able to attend class at night. Would you recommend SDSU’s Clinical Medical Assistant program to others? I have recommended this program to many people who want to go into the medical field because it has given me the tools and foundation for my future. It not only made me feel well equipped for the real world but made me feel very confident at what I do. Without the program, I wouldn’t be where I am today, and I couldn’t be happier with my life. I’m very excited to continue my educational journey and hope to maybe even teach future students someday.